Distribution and habitat: Dieffenbachia seguine is a species of Dieffenbachia native to the tropical Americas —from Southern Mexico, through Central America, to northern South America and Brazil. Also, it is native to several Caribbean islands, including Puerto Rico. The plant prefers bright to medium light and high humidity due to its normal habit of growing in tropical rain forests. It will grow in almost full sunlight once acclimated, but for best growth give it a bit of subdued light. Dieffenbachia seguine is a clustered perennial herbaceous that features ovate-oblong to oblong pointed shiny leaves. Leaves are variable in color, generally being green with patches or blotches of cream/white. As lower leaves fall off, the cane-like stem becomes noticeable. In its native habitat, plants will grow 1 to 3m (3-10 feet) in height and 0.5 to 1m (2-3 feet) in width. Mature plants may produce white or cream-coloured typical arum flower heads, but these are of little interest compared with the foliage. The flowers are followed by red berries. Cultivars and hybrids of this species expand the variegated leaf colors to include additional shades of yellow and green. Description: Dieffenbachia seguine are highly decorative foliage plants, that grows up to 1m (3 feet) tall indoors. Their thick, cane-like and unbranched stems carry rather soft and fleshy leaves on sturdy, sheathed stalks. 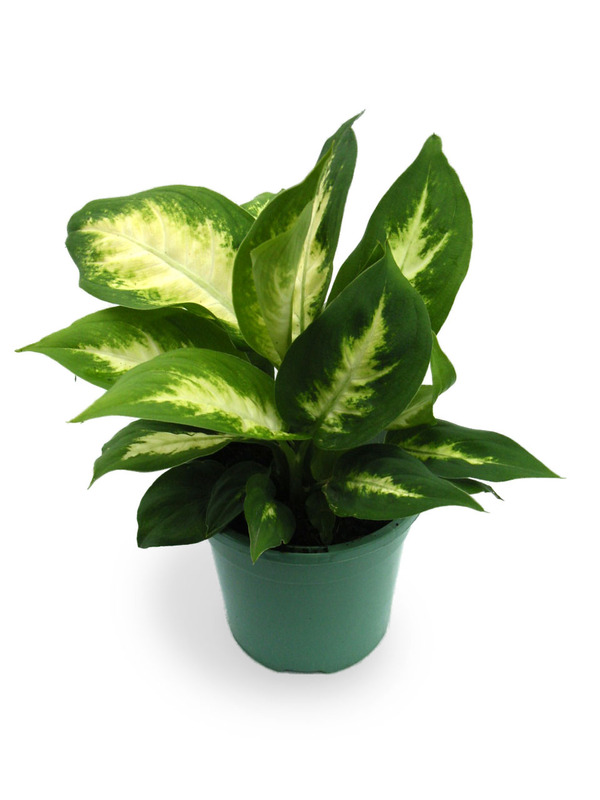 Dieffenbachia seguine has oval leaves 25cm (10 inch) long and 10cm (4 inch) wide on 10cm (4 inch) long stalks. The leaves generally spread outward and arch slightly downward. They are interestingly marked in green, yellow and white. As it age, some of the lower leaves dry up and fall off or may be pulled off leaving behind a scarred stem, which gradually lengthens. But the bare stem is likely to be at least partially hidden by the thick crown of downward arching leaves. Calla-type flowers followed by red berries rarely appear on indoor plants. Houseplant care: Dieffenbachia species are quite easy to grow and are commonly kept as houseplants. The major problem with keeping them indoors is inadequate light and humidity. As a result, they often do not survive. Dieffenbachia seguine should not be exposed to droughts. Light: Provide bright filtered light in spring, summer and autumn. During the winter the brightest possible light, including direct sunlight is best. This houseplant prefers to be within 1.5 to 2.5m (5-8 feet) of a window, but will survive lower light levels. Temperatures: Dieffenbachia seguine need warmth and cannot tolerate temperatures below about 10°C (50°F). It likes a consistently warm indoor or outdoor environment away from cool drafts. Temperatures of 18-29°C (65- 85°F) are ideal, but the plant really need minimum winter heat of 15°C (60°F) to look happy. High humidity is also essential; plants should be stood on trays of damp pebbles. Water: Water Dieffenbachia seguine moderately, enough to make the entire mixture moist, but allowing the top centimetre (0.4 inch) or so of the mixture to dry out between waterings. In a suitable warm position these plants will continue to grow throughout the year and will need the same watering at all times. Remember that Dieffenbachia seguine is a tropical rain forest plant and needs moisture at its roots. The plant should be grown in fast draining very loose and well aerated soil that can be kept damp but not soggy. Keep Dieffenbachia seguine dryer during the cold periods. Fertilising: Give actively growing Dieffenbachia seguine a liquid fertiliser about every two weeks. Do not fertilise in the winter. Potting and repotting: Use a soil based potting mixture. Move small plants into pots one size larger every spring. A 20cm (8 inch) pot is likely to be the biggest needed. If larger specimen is desired, move the plants on every other year until a 25cm (10 inch) or even 30cm (12 inch) is reached. Propagation: A top cutting 8-12cm (3-5 inch) long will root at a temperature of at least 21°C (70°F) if taken in spring or early summer. Take the cutting below a node, strip off lower leaves and dip the cut end in a hormone rooting powder. Plant the cutting in a 10cm (4 inch) pot containing a moistened equal-parts mixture of peat moss and coarse sand. Enclose the whole in a plastic bag or heated propagator care and keep it in warm in bright indirect light. When the potted cuttings has rooted (in four to six weeks) remove it from the bag or case, water it moderately and apply a liquid fertiliser every two weeks. Move it into a 12cm (5 inch) pot of standard mixture and treat it as a mature plant when it begin to fill the pot with roots. It is also possible to propagate a Dieffenbachia seguine from an 8-10cm (3-4 inch) long section of the main stem. Take a section containing at least one growth bud, place it horizontally on the surface of a moistened equal-parts rooting mixture of peat moss and coarse sand and treat it as a newly planted tip cutting. Dieffenbachia seguine can also be air layered. Problebems: With Dieffenbachia seguine problems appear usually due to incorrect treatment. Limp stems and discoloured foliage are probably due to overwatering and or low temperatures. Treatment: Keep Dieffenbachia seguine in a proper place. Wilting, yellowing and falling leaves are likely to be the result of insufficient warmth and humidity. Watch out for fungus diseases (fungal leaf spot, rots and blight) which seem to strike in cooler months when the plants’s resistance is not so high. Treatment: Spray with a good fungicide. Watch for spider mites, scale, aphids and mealybugs. Treatment: Use an adequate pesticide to eradicate the pests. Uses: Dieffenbachia seguine is an easy to maintain plant which add beauty and style to courtyards, patios and verandahs. Provides green life to indoors and helps to freshen the air of your home. It is cultivated as an ornamental plant in temperate shade gardens and as a potted house plant. The Dieffenbachia seguine has a dramatic growth in a greenhouse. As well as absorbing carbon dioxide and releasing oxygen, as all plants do, Dieffenbachia seguine also eliminate significant amounts of xylene and toluene, being on the first list of air-filtering plants compiled by NASA as part of the NASA Clean Air Study. Notes: The nomenclature of the genus Dieffenbachia can be confusing and the many hybrids/cultivars are now considered variations of a single species, Dieffenbachia seguine. Toxicity: The sap of Dieffenbachia seguine is poisonous. Be sure to wash hands thoroughly after removing faded leaves or taking cuttings. If it gets in the mouth, it can cause swelling, pain and temporary loss of speech – which explains one of its common names ‘dumb-cane’. Keep small children away from these plants to avoid accidents.